The garden continues to shine. The rain has fallen all week, though mostly at night. I grew up in East Anglia, on a heavy yellow clay and through the winter the lawn would shine like a rice paddy. I thought I had left all that behind, but this week the grass slope has sparkled like a mirror that needs shaving. The evenings have started to draw out noticeably. It is amazing the difference an extra half hour makes. I have spent my spare time this week repotting the Pleione and it feels like the first act of a new season, like pricking out seedlings or despairing about the state of the mower. Weather permitting there is still plenty of the old season to tidy away but the new year is firmly on the agenda. High winds blew one of the larger Leyland Cypress over. I'm not sure how they reached it in the very centre of a plantation, but over it went. I had already listed it for felling so it isn't missed, and it hasn't landed on anything important so it can stay where it is until I have a day spare. And caught admiring the chaos of change I stepped back in wonder, tripped on a bucket and nearly sat on my 'Paradise Blush' (ooo-er). I hadn't noticed the buds developing and even in the sudden backwards and downwards motion of the moment I registered some surprise. Planted about three years ago when I finally got fed up with having an army of potted Camellias waiting for homes, it has been slow to establish and would prefer more sun. Wouldn't we all. 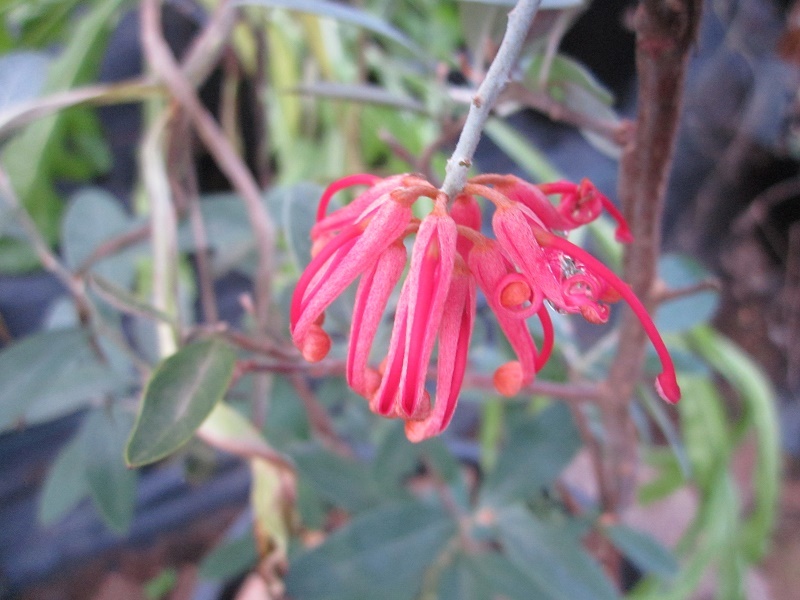 For a couple of years now I have been looking at the new wave of Grevillea that have appeared on the market. I had a few in the 1980's, but the snows of '88 and '89 wiped them out and made me a little nervous about starting again. I was getting ready to dip a tentative toe back into the water (which is unfortunately literal at present) when a friend gave me this one. It is planted in the Agave house because I am sure it will prefer dry sunny conditions and I have a damp shady garden. I have been enjoying the broad silvery leaves with the same quizzical interest as a philosopher observing a politician. Scarlet flowers in the middle of winter have filled me with enthusiasm but (uncharacteristically for me) not the sort that is likely to bubble over. Perhaps it is the sombre atmosphere of the Agave house bringing me down. It is currently filled with large, cherished and tender plants that could all be dead in a fortnight if it turns stabbingly cold. An Australian species from the mountains of New South Wales and Victoria. Named after the Queen and not after the state that was named after the Queen, if you see what I mean. Perhaps it is the nature of a whimsical mind that it wanders. 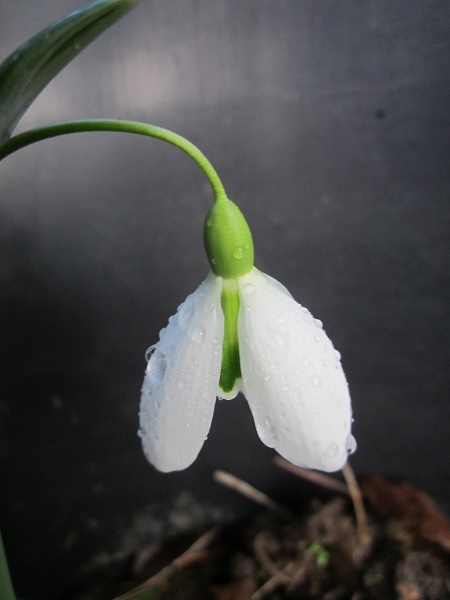 It is the snowdrop season and I have been watching (from a polite distance) the actions ond opinions of the snowdrop obsessives. I like to think I have been watching kindly. The only time I have laughed out loud has been when I was alone in the privacy of my own garden, and it was (mostly) myself I was laughing at. Is it the endless minute variations among snowdrops that attract attention or the earnest interest of the people who study the endless minute variations? Is the charm wrapped up in the dangling white flowers or the besotted old people? I haven't answered that one to my own satisfaction. Perhaps I shouldn't have asked the question. 'John Gray' and 'Little John' are both in flower at the moment, and are sufficiently similar to mean that the written word would slip quietly into insanity trying to distinguish them yet the former rises magnificently while the latter remains half-baked. Some characters remain intangible. 'John Gray' came from the garden of John Gray after his death, dug and distributed by E.B. Anderson. Large flowers produced on short scapes at the start of the season that slowly elongate. Words, unfortunately, are not sufficient. 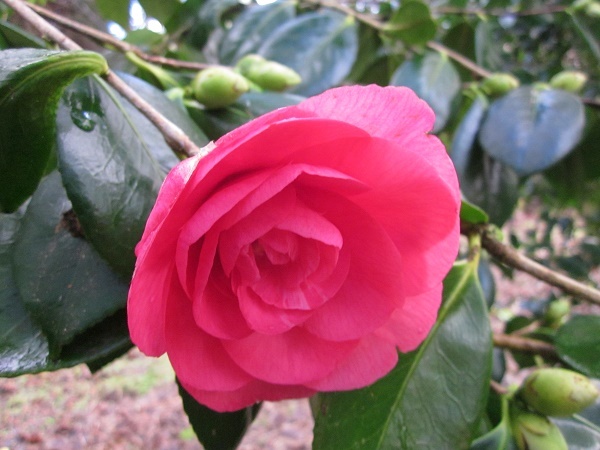 Camellias suffer from an unfortunate abilty to provide an excess where moderation would be more satisfactory. At present they are being delightful in the garden. 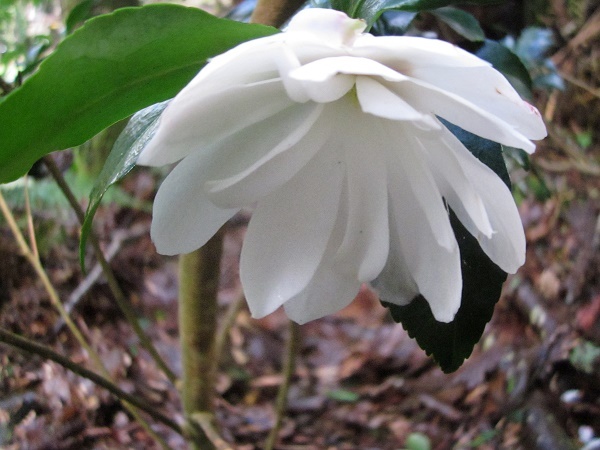 The more established bushes have started to open an occasional flower, here or there. 'Drama Girl' has this solitary bloom tucked away on the south side. It is a marvel of precision, perfectly set in its the rich green leafy heart . The flowers are salmon pink and the yellow tones are emphasised as the flower ages. At the moment it is a delicate marvel of spring perfection. Unfortunately the branches are encrusted with fat hard buds that will burst onto the world like the spawn of Satan. 'Drama Girl' will erupt into merciless pink and shout the world into submission, scattering petals and dead flowers upon the audience. Whoever chose the name knew a thing or two about amateur dramatics. Raised in California in 1950, the parentage is not recorded but it has flowers as big as many of the hybrids, and produces them with great enthusiasm. Credit where it is due, it is wonderful at the moment and will remain so for some time. Last week I was concerned that the cold weather was creeping towards us. I covered a few things up with fleece. It hasn't arrived but the fear remains. As with 'Drama Girl', I am enjoying the days of wonder and not worrying too much about the potential horror to come.